The editor of The Art Workers' Quarterly was W.G. Paulson Townsend, author of several books and articles on the decorative arts. In his foreword to volume 1, no. 1, he wrote that the objective of the journal was to provide a source of inspiration for art workers and “to supply designs in a readily applicable form to those who do not invent, plan, or adapt ornament, and who find difficulty in obtaining good and suitable suggestions for their work. Further, it is his aim to assist those who may have some knowledge of the principles on which ornamental design is constructed, by publishing specimens of good work from the best historical and contemporary examples”. Like The Craftsman, launched the previous year in the USA, William Morris was the subject of the first article in The Art Workers’ Quarterly. Subsequent articles reported on the work and activities of the leading art schools including the Royal Academy Schools, Royal School of Art Needlework, the Royal College of Art, Central School of Arts and Crafts, Camberwell School of Arts and Crafts, and Keswick School of Industrial Arts, and the principle craft organizations, guilds and societies such as the Church Crafts League, the Home Arts and Industries Association, the Dress Designers Exhibition Society, the Clarion Guild of Handicrafts, and the Arts and Crafts Exhibition Society. There are also articles on the British Section at the St. Louis Exposition of 1904; the Impact of Modern Social and Economic Conditions on the Decorative Arts; the architecture of Letchworth Garden City, etc. These were interspersed with practical, well-illustrated articles on wood block printing, mural decoration, ornamental lettering, metalwork, embroidery, weaving, furniture, ceramics, stained glass, bookbinding, etc. Townsend was successful in attracting many of the leading commentators on the decorative arts to write pieces for The Art Workers’ Quarterly, including May Morris, Walter Crane, J. Illingworth Kay, Alexander Fisher, Lawrence Weaver, Bernard Rackham, Silvester Sparrow, Alfred Stevens, A. Romney Green, and James Guthrie. Among artists and designers whose work featured in The Art Workers’ Quarterly were some of the major figures in the English Arts and Crafts movement including Ambrose Heal Jr., Walter Crane, C.F.A. Voysey, Alexander Fisher, May Morris, R.A. Dawson. W.J. Neatby, Harold Stabler, Allan Vigers, W. Curtis Green, A. Romney Green. Heywood Sumner, Charles E. Dawson, Edward Spencer, Bernard Cuzner, Arthur Gaskin, Charles Spooner, C.R. Ashbee, Paul Woodroffe, Ernest Gimson, Mary Seton Fraser Tytler (Mrs G.F. Watts), Ernestine Mills and Sidney Barnsley. 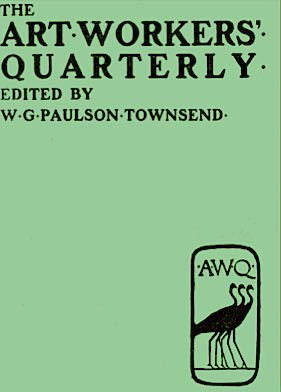 An additional two special issues of The Art Workers’ Quarterly were published in August and December 1908. These contained the papers and extracts of papers read at the Third International Art Congress for the development of Drawing and Art Teaching and the Application to Industries held in London in August 1908, as well as a record of the Retrospective Exhibition of Students’ Works, held at the Victoria & Albert Museum, London, in connection with the Congress. Together with volumes 1-5 of The Art Workers’ Quarterly, these have also been digitized.